Announcing the timed Sectors for 2018! Please scroll to bottom. * Consider using live segments on your Garmin. Next to the segment name on Strava, there is a star. Click the star. Then sync your Garmin with Strava and Garmin connect. Click the "Training" icon on your Garmin, and use the menu to select "enable segments." You will receive a warning as the segment approaches and will track your time and stop when the segment ends. * Weather looks perfect for Sunday. Around 51 degrees at the start, warming to about 70 degrees by the time we are done. I scouted some trails today, a few wet spots, but otherwise everything is green and tacky, just how we like it. * There is plenty of water on the course, but no food. Be sure you have enough food to keep you going for about 5 hours. * Trail courtesy is the single most important thing to remember. You must always ride at a safe speed. Please read again the rules below, and do mount a bell on your handlebars if you have one. * I will have route sheets at the start, which will also call out the timed Sectors, and where to find water and rest rooms. * We start early to avoid crowds and to have optimal trail conditions. Please do not be late. 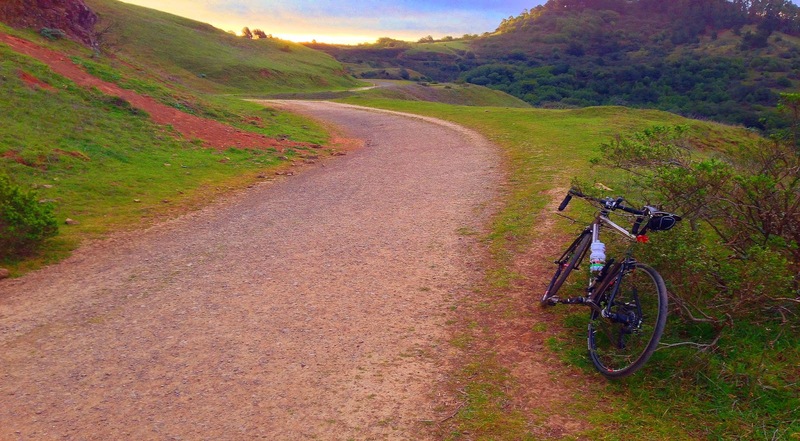 Nifty Mixty is a 45 mile mixed terrain adventure ride in the East Bay Hills with over 6,000' of climbing. There will be 6 timed Sectors, while the remainder of the course is neutral. Take your time on the neutral sections, regroup, socialize, navigate, etc. About 80% dirt and 20% paved. Most dirt is smooth and most (but not all) grades are moderate. The course is doable on a road bike with sturdy tires, or, on the other extreme, a squishy mt. bike, however a gravel, cross, or hard tail mt. bike is recommended. The ideal bike for the event is either a cross/gravel bike with 32-40mm dirt tires, or a light mt. bike hard tail with fast tires. The event is April 22, 2018, Cerrito Vista Park, Moeser Ln at Pomona Ave, El Cerrito, CA., 7:30 A.M, registration at 7:00 AM. $10 entry fee to be included in results and prize pool. Please check out the Nifty Mixty Facebook Event Page and RSVP if you are coming. Here is the Nifty Mixty 2018 Route. Check back for updated versions. Note: Route updated 4/19 to include Skyline Trail, and skipping Quarry Rd./Volcanic Trail/Quarry Trail. 1. This is a handicapped event. All riders participate on equal footing. I have scientific data that accounts for differences in gender and age. So if you are a studly Cat 1, 28 year old dude, you have the same chance as a fit, 60 year old woman who is age group National Champ. 3. Be courteous to other trail users. Slow down, call out to hikers, and pass as to not frighten anyone. Say hello, Good Morning, and comment about how nice a day it is! If you see a horseback rider, you MUST STOP! Ask the rider if it is OK to pass. And then do so slowly and carefully once you have permission. No shifting, skidding, or any other sudden movements or noises that could spook a horse. This is SERIOUS! A handlebar mounted bell is highly encouraged. 4. For each timed segment, the results will be handicapped and a leader board with placings will be determined. Riders will then have 6 scores with individual placings. The individual placings for each Sector will be added up, and the rider with the lowest score will be the winner. This means that all segments are weighted equally, regardless of length or elapsed time. It is possible, depending on accuracy of GPS data, that each rider will be allowed 1-2 "throwout" segments. Regardless of throw outs, a rider must complete the entire course to be scored. 5. Riders will be responsible for delivering accurate Sector times and uploading them to Strava by 8 PM April 22nd following the ride. If you have a Garmin 500, I highly recommend that you also bring your iPhone or Android device and record a second file. Garmin 500's have inferior GPS accuracy, and your iPhone is actually much better. If a rider has spotty GPS data, I will be unable to match segments and that rider will not be listed in results. Again, if you have a Garmin 500, try to take backup measures. Heck, why not run your iPhone or Android as a backup no matter what Garmin (or other) device you have. But do not upload 2 files. The backup is only in the event that you are missing Sectors on your main file. 6. There are 10 Sectors on Strava, all labeled with Nifty Mixty Sector X (but only 6 will be scored in 2018). The 2018 Segments are called out on Strava. You are responsible to know where these are. The Sectors are designed such that there is little or no navigation required within the Sector. But it will be prudent to know where the Sector starts and ends. Sectors will start well after, and end well before any gates or obstacles, so plenty of time to get rolling at the beginning, and plenty of room to stop before the end. No need to impale yourself on a gate because you think the Sector ends there. It doesn't. Each Sector is called out in the Cue Sheet with mileage and a short description. 8. Single Speed riders shall have a 5% time bonus in addition to the standard age/gender bonus. Since most of the Sectors are Single Speed friendly, it is reasonable to assume that if you are a strong Single Speed rider, you will have an advantage. Single speed riders must use the same gear for the entire event. Duh. It's Single Speed.